In a recent blog post, Sholeh Ehdaivand, President and CEO of LMK Clinical Research Consulting, discussed the benefits of migrating from paper or hybrid TMF to eTMF. In her blog post, Sholeh wrote at length about the potential of a “shiny, new eTMF system”. Simply put, the transformative potential of the eTMF is astounding. Beyond increased access, collaboration, and efficiency, a modern eTMF can improve inspection readiness and accelerate study timelines. So why isn’t all clinical documentation in a shiny new eTMF system? Because change takes risk. In her blog post, Sholeh analyzes the most common barriers to TMF migration. In considering the many barriers to eTMF adoption, it becomes clear that within a regulated industry, risk must always be balanced with effort and cost. When deciding to make the jump to eTMF, selecting the correct eTMF system for your team’s needs is only an initial step. Embarking on the TMF migration journey requires “one simple concept: a plan”. You TMF plan must establish a clear migration objective and define the incremental steps necessary to achieve migration success. Adopting a new eTMF system means learning a host of new skills. Expecting your team to learn these skills without proper training produces anxiety. Your new eTMF system may have a built-in training program, but this training program may only cover the basics. LMK offers TMF training through its industry-leading TMF University program. Even with the best training, however, your team won’t be successful in an environment that discourages positive risk or penalizes those that ask for help. One of the best ways to alleviate eTMF migration anxiety is by making it clear that no one becomes an eTMF expert overnight – and that these new eTMF skills will be developed together as a team. TMF stakeholders are often “overzealous and want to migrate EVERYTHING from its legacy system”. But just as you must consider the history of your TMF before migration, it’s also wise to consider the history of your team. How will an eTMF migration play to the strengths and weakness of your document stakeholders? Who will feel included and who will feel marginalized by the decision to migrate? How and when you choose to migrate a TMF should reflect the diversity and story of your team, not just your regulatory objectives or resource constraints. As discussed in Sholeh’s blog post, the best way to insure your migration’s success is to plan. Your migration plan, however, shouldn’t just define your goals, but also outline the resources needed to complete them. Time is one of the most important resources to consider but is often overlooked. We encourage TMF leaders to envision what each day, week, and month of their migration will look like and communicate this information with their team. Change can mean risk and anxiety but is also an indispensable component of innovation. 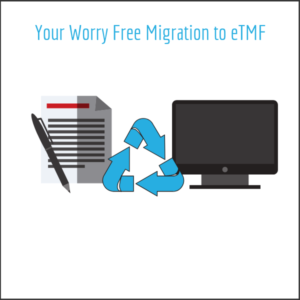 Our three tips for a worry free eTMF migration challenge you to consider the human-centered nature of your TMF just as you consider the other technical and resource aspects of your eTMF migration. Remember, it’s the people behind your TMF that will make your eTMF goals a reality. Resolving their worries, acknowledging their individual contributions, and supporting their growth is foundational to your eTMF success.